I´m under the weather this week, so I’ll stick to re-posting interesting things that reach my Inbox. Today, Bloomberg has a story on how the military find all sorts of goodies, from cars to apartments, while regular Venezuelans face shortages. One thing that has always baffled me about my country is how the military remains one of the more prestigious institutions. With rare exceptions, the Venezuelan military is an abusive, overweight, scamming, public-money sucking, toll-charging, unprofessional group of drug smugglers … … and yet people revere them. 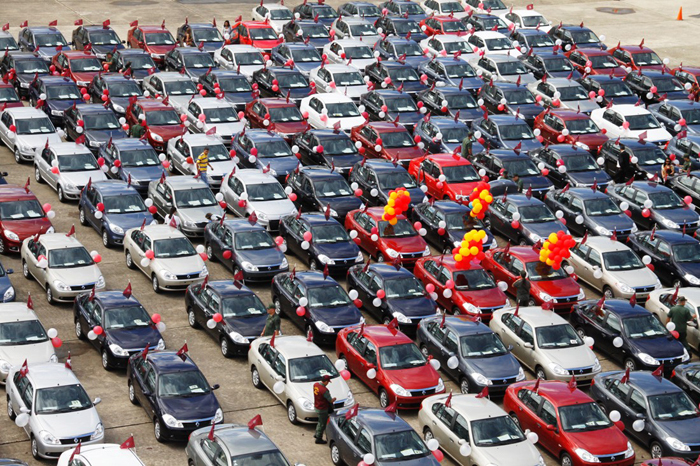 At Fort Tiuna in southern Caracas, hundreds of new Chinese cars glistened in the parking lots, after former Defense Minister Diego Molero pledged in May of last year to purchase 20,000 autos for the armed forces. There is one general for every 34 servicemen in Venezuela, compared with one for 1,490 servicemen in the U.S., based on the latest figures from the countries’ ministries of defense. Count the Armed Forces alongside Wall Street and China as the three groups Maduro will never default on. That´s why it pains me to read simplistic stuff such as García Mora’s latest, where he wonders out loud when the country will finally break. As long as there´s enough cash to go around to keep the military happy, Maduro seems pretty safe to me. Sometimes, the answer is really simple.